Let me start by sending out a massive THANK YOU to the whole YTC community. I believe last week's article set a new record for the amount of feedback it received. The aim of the article was to have you bring your goals closer. Closer in time. And just a small stretch above and beyond your current capabilities. This ensures that you receive quicker feedback. And most importantly, that you have a greater chance of achieving the goal. Small wins, received often, do wonders for your mindset and self-belief. Plus… it's just the way that progress works. So many things in life are achieved through small, incremental steps. For some reason we tend to forget that when it comes to trading. I was most excited mid-week to see a new blog post by Dr Brett Steenbarger, which ties in nicely with our "stretch goals". Dr Steenbarger has for a long time been one of my favourite trading educators. His writing is of the highest quality. Every blog post is something I never miss. "…the way in which we set goals greatly impacts the probability of our success and the mindset we're likely to come away with." "…the importance of keeping goal-setting flexible and doable. Flexible means revising goals at intervals: for example, setting monthly goals rather than annual ones. Doable means that both the number of goals and their difficulty be set in such a way as to set us up for success rather than frustration. Many big goals can be broken down into a sequence of smaller ones that create an ongoing sense of progress and momentum." "Over time, the accumulation of small goals creates large changes. The idea is to make each day a win, regardless of the P/L of the moment. That creates peace of mind, and peace of mind frees us up to trade with open minds." I'd like to also share with you an extra step to the "stretch goals" which I shared with a couple of traders via email last weekend. It's the idea of having TWO TIERS of goal-setting. To ensure an even greater likelihood of success and peace of mind. 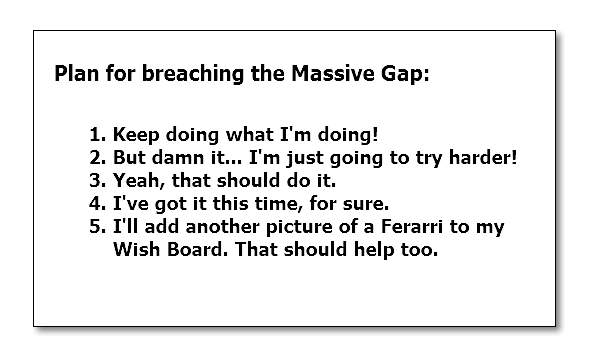 The aim of our "stretch goals" last week was to ensure that it targets something only a slight reach beyond current capabilities. But this of course doesn't mean we'll achieve it. And that's fine. The reality is that we won't always achieve this new level of performance. But we will learn. And we can review our plan for achievement of the goals. Or even amend the goals themselves, bringing them another step closer. And then we launch ourselves off on another attempt. This is where it can help to have two tiers of goal setting. Our stretch goal is the second tier. It's the one we're really pushing for. It's the one we put all our focus and attention on achieving. But it's also something that we completely accept we may not achieve. Or may not achieve, just yet. But we NEVER judge our self-worth on achievement of this goal. EVER! Because, although it's just a small stretch, it might take a lot longer than we expect. This is where the first tier can help. Set something that is so damn easy that you absolutely should achieve it. However you want to define that is fine. 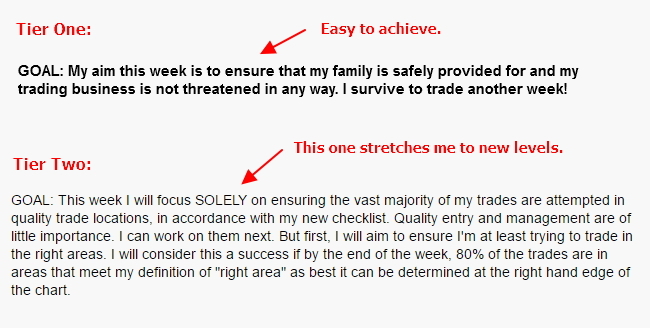 For me it would be – "My aim this week is to ensure that my family is safely provided for and my trading business is not threatened in any way. I survive to trade another week!" Don't under any circumstances allow failure to achieve Tier 2 to influence your self-belief. You achieved Tier 1. That is awesome. Well done. Now, examine Tier 2 and find out why you didn't achieve it. And set in place plans for the next assault at that target. It's all about maintenance of a positive mindset, while at the same time always pushing yourself to expand to new levels of performance and skill. Consider the use of two-tier goal setting in order to maintain a positive mindset, while still stretching to reach the next level. And set your goals. Trading recommences in early January. What are your goals for the first week? Do not start trading until they're clearly defined. 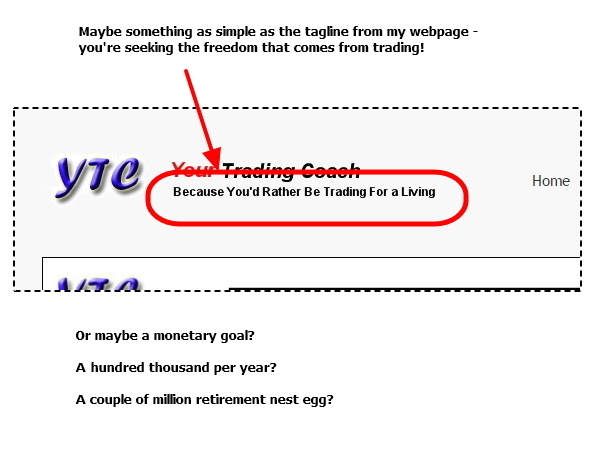 Do you have trading goals? Whatever it is, that's fine. As long as you're making progress towards that goal. Let's be honest though… are you actually making progress? But I speak to a lot of developing traders and the fact is that MOST are not making progress. The target is just too far away to be able to see any real progress. And even worse, there is no solid plan for how to get there. Step 1: Bring your goal closer in time. Much closer. No more than a month away. Ideally weekly. Let's say for example that your goal is to achieve $100k per annum. But you're not yet able to ever achieve a positive week. "That's too far away. Bring it closer." GOAL: Ok, I will aim to achieve $8k months. "Which is how much per week?" GOAL: I will aim to consistently achieve a weekly average of $2k. Step 2: Reduce the size of the goal till it's just a slight stretch beyond your current capabilities. A goal of $2k per week is fine. But if you're not yet even achieving positive weeks, it's kind of pointless. If your goal cannot be reached from your current location, within three or four attempts, then your goal is crap. You'll just churn away week after week getting more and more frustrated. Your goal should stretch you just beyond your current capabilities. And it should be something you feel that, with improvements in process, you might have a chance of achieving in three or four attempts. GOAL: Ok. Let's reduce the weekly target to a much more achievable $1k. "Too much. You can't even achieve breakeven." GOAL: Fine. My goal this week is to achieve a breakeven week. "Good. You're close to that already. It's just a small stretch. Remember, when you achieve that, and can prove it repeatable, you will then set further goals to stretch to the next higher level. And so on and so on until eventually you're achieving your original goal." Step 3: Focus on process improvements required to achieve this outcome. Break the trading process down into as many smaller sub-processes as you can. Find the one part that, if improved, will provide the greatest impact upon results. And then set your goal to improve that part of the process. It might not be sufficient in and of itself to reach your monetary goal. But it's a start. Once achieved, with consistency, you can then find the next area of improvement. "Break the whole trading process down into parts for me. However it makes sense to you." "Ok. How about (a) quality trading ideas, (b) quality entry and (c) quality trade management." "Fine. Which area is currently contributing to your inability to achieve a breakeven week?" "All of them. But ok, perhaps the trading ideas. Too many, when looked at with hindsight, are just in poor chart locations. Far too late in the move. In retail zones, I guess you could call it. Definitely not where the professionals are trading." "So what process changes can you make, and what daily goals can you set, to give you greater chance of trading in good chart locations?" "I can spend some time this weekend defining "quality trade locations" including the point at which entry is too late. I can put something in checklist form. And then I can then work this week with the following goal:"
GOAL: This week I will focus SOLELY on ensuring the vast majority of my trades are attempted in quality trade locations, in accordance with my new checklist. Quality entry and management are of little importance. I can work on them next. But first, I will aim to ensure I'm at least trying to trade in the right areas. I will consider this a success if by the end of the week, 80% of the trades are in areas that meet my definition of "right area" as best it can be determined at the right hand edge of the chart. But the point is that it takes the goal from something outside the realm of immediate possibility, to something that is much more achievable in a short timeframe. Progress won't be guaranteed, of course. It might take three to four attempts, with further improvements to the process each weekend. But if progress is not seen after several attempts, break down the process goal even further to something even smaller and more achievable. Your aim is to start accumulating small wins in the direction of your original and ultimate goal. And if our trader achieves consistency in trading in better trade areas, but still fails to achieve breakeven weeks due to poor entry or trade management, then the process goal shifts to these areas. At some point, a breakeven week will be achieved. The goal might shift then to repeating this same level of performance, just to prove it's not a fluke. And then… maybe aiming for something greater. Maybe three out of four weeks positive, with the losing week smaller than the average winning week. Each step just slightly beyond the current level of achievement. I don't know what your goals are. And I don't know your current level of performance. But whatever they are, if you're just churning away week after week without any clear evidence that you're closing that gap, you need to take action. Stretch… just a little bit. And fight to get to this new level. Stop accepting failure. Redefine your goals so that you can achieve small incremental wins. As we come to the end of year you’re all hopefully spending some time to review the prior year and plan the upcoming year. Maybe you’ll even make some New Years trading resolutions! The following five steps will assist in making better plans and resolutions; hopefully allowing you to stick to them beyond the 2nd of January. Have I achieved my trading goals? Why? Why not? Are my trading goals still relevant? Is my trading plan current? Does it accurately reflect how I trade? What is the strongest part of my trading plan? What can I do to improve it? What is the weakest part of my trading plan? What can I do to improve it? What can I do to minimise the risk or impact? What is the area of my trading plan that I haven’t really developed to its fullest potential? Do I really know whether my plan provides a positive expectancy? How do I know? What is one thing I could do right now to improve my pre-trading preparation? What is one thing I could do right now to improve my identification of setups? What is one thing I could do right now to improve my entries? What is one thing I could do right now to improve my trade management? What is one thing I could do right now to improve my exits? What is one thing I could do right now to improve my post-trade review process? What is one thing I could do right now to improve my record keeping? What is one thing I could do right now to improve my longer term reviews (weekly, monthly, biannually)? What is one thing I could do right now to improve my discipline? What is one thing I could do right now to improve my consistency? What is one thing I could do right now to improve my trading psychology? What is one thing I could do right now to improve my money management? What is one thing I could do right now to improve my risk management? What do I fear most in my trading? What am I embarrassed to talk to others about when discussing my trading? What was the low point of the last six months? What will I do to prevent that reoccurring? What was the high point of the last six months? What will I do to ensure that repeats again in future? How do I plan to improve in coming months? What are my current life goals? What are my current trading goals. Trading stopped for me yesterday (22nd December) and will not recommence till the first Tuesday in the new year. Yes, markets are open during this period, but with many professional and institutional participants on holidays, volumes will be lighter and any opportunity will be lower probability. I prefer to take a break rather than push my luck. Take a complete break away from trading to relax, recharge and refresh yourself – body, mind and soul! Take the opportunity to work on improving your trading in any of the key areas – knowledge, skill and attitude. Or of course any combination of the two. Option 1 is a valid choice. If you're tired and fatigued or if you've neglected your family or friends then take this opportunity to restore the balance in your life. But if you're not satisfied with your trading, and you're not overly fatigued, you'll want to spend some time on option 2. For me, I've allocated Christmas Day as a day free from all thoughts of trading. And January 1st & 2nd as days for… well… let's just call it recovery. But every other day I've allocated a block of up to two hours for trading review, study and practice. Don't just make this up as you go. Plan ahead to ensure you make the most effective use of your time. Double click the following image to open a study planner template in your browser (or right click here and save a copy of this PDF template). Print it out, get a pen, and spend an hour planning how you can best use your time over the next week and a half. Enter your goals and tasks on page one, for each of the key areas of Knowledge, Skill or Attitude. And then reference them from the calendar on page two. For example, I would enter a reference of "S21" meaning that on this day I would work on Skill, Goal 2, Task 1). Don't waste this learning opportunity. I am guilty of allowing my trading development to stagnate. Generally happy with my level of performance, I have seen little new progress over the last year. To some degree, the 3-4 hours per day answering YTC emails and writing a new blog post or newsletter article does get in the way. But it's not a valid excuse. In fact, I wonder sometimes if this is simply a convenient rationalisation allowing me to avoid the fear and discomfort of further progress. I need to work on increasing size. I need to improve my ability to hold the potential outliers for longer. And I need to further explore options for trading during MY timezone, whether via longer timeframes or one of the Asian session futures contracts, as I'm not sure how many more years I'll be interested in working till 3am. Have you also accepted less than you're capable of achieving? We fear growth because to grow means to always be operating just outside of our comfort zone. Always stretching and striving for more. Growth involves risk. But the greater risk is the risk of stagnation.Just as water loses its purity through stagnation, so to does our passion for life and our passion for trading. If your trading performance is good, it's only because you haven't yet made it better. Stop resting on your laurels.Take action. Face your fears and proceed ever more boldly forward towards them. This is the path to greatness. In the absence of a curriculum for trader training, and of a mentor who can provide daily guidance, oversight and correction, we are largely left on our own to both chart and navigate our path forward from novice to (hopefully) becoming a professional and consistently profitable trader. All too often though, the way forward is obscured. And we find ourselves scattered and confused as we are bombarded from all directions by conflicting and ambiguous advice; regardless of whether from well-meaning and respected educators, unscrupulous promoters of Holy Grail trading solutions, or from our own exploration within the mediocrity of trading forums. Our efforts are spread too thinly across too many fields, allowing us to master none. Our progress is often more a result of chance, as opposed to planned and determined application of effort. Our motivation levels parallel our equity curve, with bursts of excitement and enthusiasm one day, followed the next day by crushing defeat and a feeling of never-ending despair. Ok… enough of that…. the picture is painted. What's the solution? The following is a concept that will aid in your trader development, despite the lack of curriculum and despite the lack of full-time mentor. It doesn't replace any current routines and learning strategies which you may find effective; rather it should work easily and effectively alongside them. Or if you have no current plans for your own trader development, it will operate effectively as a starting point. It ensures progress through providing that which was missing from our previous attempts… FOCUS. If you’d like to survive in this game, you need to learn. And while the books and courses are good, the best learning comes from making trades and reviewing your performance. So, as we approach the end of the first quarter of 2009, I thought I should prod you a little and encourage you to take some time out to review your performance so far this year. Nothing too difficult – just six quick questions. Even if you don’t have a formal business review planned for each quarter, it can be helpful to at least pause for an hour or so to consider your performance through the first quarter. This quarter has set the foundation for the remainder of the year. If your performance has been below par then you need to identify the cause and halt the decline right now. If your performance has met your goals, then you need to recognize that as well – reward yourself, and identify what you’re doing right to reinforce the lesson. Has your winning percentage meet your target percentage? Has your win/loss size ratio meet your target levels? Has your bottom line P&L met your goals? Have you consistently traded in accordance with your plan? Are you maintaining focus throughout your trading session? Are you enjoying your trading? If any of the above are not meeting expectations, then you have some work to do. Right now as I sit and write this article, it’s coming up to the end of 2008 and I’ll be shortly taking a well-deserved break from the markets and my website. Of course, as an admission that I’m addicted to trading, this won’t be a total break. I have some trading books to read and will be taking time out to conduct a review of my 2008 performance and to plan for 2009. I highly recommend that you do the same. Don’t get me wrong, reviewing your trading performance is not just a ‘once a year’ event. I actually conduct different types of review after each trade, after each session, after each week and then again monthly. And I also complete a six monthly review, one of those being now, at the end of the calendar year. While I will be reviewing my P&L figures and drilling right down into the stats such as winning percentage and win/loss size ratio for each of the setups, my biannual review is not so much about that stuff. That gets taken care of on a monthly basis.